Thesun's temper ebbs and flows on what scientists had thought was a prettypredictable cycle, but lately our closest star has been acting up. Typically,a few stormy years would knock out a satellite or two and maybe trip a powergrid on Earth. Then a few years of quiet, and then back to the bad behavior. Butan extremely long stretch of low activity in recent years has scientistsbaffled and scrambling for better forecasting models. Anexpected minimum of solar activity, between 2008 and 2009, was unusually deep. 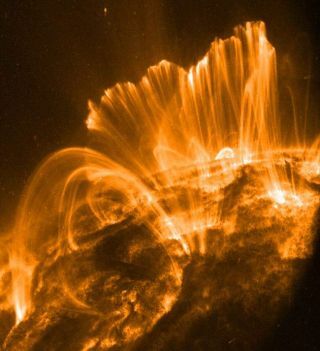 Andwhile the sun would normally rampup activity by now, heading into its next cycle, the sun may be on theverge of a weak solar cycle instead, astronomers said at the 216th meeting ofthe American Astronomical Society in Miami last month. "We'rewitnessing something unlike anything we've seen in 100 years," said DavidHathaway of NASA's Marshall Space Flight Center in Huntsville, Ala.
Thesun's constant interactionwith Earth makes it important for solar physicists to keep track of solaractivity. Stormy periods can force special safety precautions by satelliteoperators and power grid managers, and astronauts can be put at risk frombursts of radiation spat out by solar storm. Scientists need to more reliably predict what'sin store. At the conference, four solar physicists presented four very differentmethods of measuring and tracking solar cycles. ? Sunspotsare areas of concentrated magnetic activity that appear as dark dots on thesolar surface. The ebb and flow of the sun's magnetic activity, manifested inthe appearance of sunspots, make up the solar cycle. Typically,a cycle lasts about 11 years, taking roughly 5.5 years to move from a solarminimum, a period of time when there are few sunspots, to peak at the solarmaximum, during which sunspot activity is amplified. Theprevious cycle 23's extraordinary minimum recorded the highest number of dayswithout sunspots that researchers had seen since 1913, said Hathaway. Hathawayand his team of researchers measured what is called the meridional flow, whichis the circulation of stellar material from the sun's equator toward the polesand back again. This flow can often influence a cycle's strength. Thescientists examined the changes in the structure of the flow, and the levels ofgeomagnetic activity, as they corresponded to the minimums and maximums of theprevious solar cycles. "Wefound that there were variations in the strength of that flow," Hathawaysaid. "The last minimum in 1996, that velocity was about 11 meters persecond (about 22 miles an hour), which is pretty slow for an object as big asthe sun. That flow slowed down as we went to maximum in 2001." Themeridional flow then quickly increased again, and by 2004, it was faster thanit was at the last maximum, said Hathaway. This flow continued to stay fast onthe approach to this most recent minimum. "Mysuspicion is that this sunspot cycle 23 was a weaker cycle than the last two,with fewer sunspots and weaker magnetic fields. These may feed into whathappens with the meridional flow that is going to lead to another weakcycle." Hathawaypredicts that cycle 24 should reach its peak in mid-2013 at about half the sizeof the last three cycles. Ina different approach, Sushanta Tripathy of the National Solar Observatory usedthe frequencies of acoustic oscillations to look for signatures of changes inthe solar activity cycle. Tripathyfound that changes in acoustic frequencies were, for the most part, in phasewith solar activity. But, during the extended minimum, he noticed that thefrequencies of waves that cover a large portion of the solar interior becameout of sync with solar activity. "Wefind that the frequencies of sound waves that travel to the deep interior showan early minimum during late 2007, while the waves that are confined to nearthe surface show the signature of minimum in late 2008, nearly coinciding withsolar activity minimum." Thetwo seismic lulls detected using acoustic oscillation have not been seen beforein previous cycles, said Tripathy, leading researchers to conclude that the extendedminimum between cycles 23 and 24 is quite unusual. FrankHill, also of the National Solar Observatory, took a separate approach,attempting to predict the sunspot cycle based on a phenomena on the sun thatcan be likened to solar jet streams. Thiseast-west flow on the surface of the sun was first discovered in 1980, and isknown as "torsional oscillation." Thejet stream exists at a depth of at least 65,000 miles (about 105,000kilometers) below the solar surface, and Hill and his team of researchers wereable to examine its behavior at a depth of 600 miles (966 km). "Theposition of the magnetic field is very highly correlated with the position ofthis flow," Hill said. "From helioseismology, we see the flows fortwo prominent cycles ? Cycle 23, the cycle that we're coming out of, and Cycle24, the cycle that we're in now." Itturns out that the flow appears well before the level that solar activityspikes. This led the researchers to conclude that there is some sort oftriggering mechanism that appears before the onset of activity. Whileobservations of the solar jet could one day be useful for predicting the timingof the solar cycles, a larger data set is still required to ensure the method'saccuracy. "We'redefinitely going to need several cycles to improve the predictions," Hillsaid. Furtherinvestigation will also be needed to determine whether the jet stream is acause or effect of the solar cycle. Inyet another approach, Julia Saba of SP Systems and NASA's Goddard Space FlightCenter in Greenbelt, Md., used X-ray and magnetic field strength indicators inorder to predict the precise time mark for the onset of solar cycles. Sabaused magnetic maps of the sun, called synoptic charts, to observe solar cycles21 through 23 and into 24. By evaluating trends in X-ray activity, Saba wasable to predict the onset approximately 18 months ahead of time, and wasaccurate to within two months. "ByMay of 2010, we see that cycle 24 is clearly underway, though things are stillpretty quiet in the southern hemisphere in general," Saba said. Thismethod of determining a solar cycle's onset could be a valuable way to comparethe different phases in solar activity because it can be observed in nearreal-time, Saba explained. "It'sa little easier to tell in real time than by solar maximum or solarminimum," she said. Whilethe four ways of monitoring solar activity take different approaches, theresearchers are all in agreement that we are witnessing an interesting minimum.And while these methods could be useful for future studies of solar cycles,they all require further research. "Oneproblem we have with all solar cycle studies is the statistics of smallnumbers," Hathaway said. "Even with 23 sunspot cycles, it's notenough. What we've seen today are some newer measurements that weren'tavailable even two cycles ago that are shedding new light. We need to becareful with using what we've seen from one or two cycles to make inferencesfor all of them."